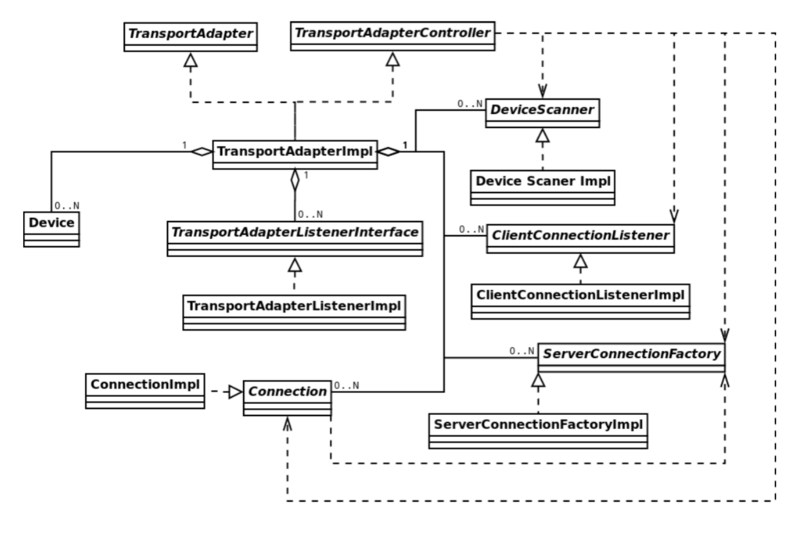 As a developer implementing SDL Core into a vehicle, you may need to create new transport adapters to support custom transport implementations and libraries for Bluetooth, USB, etc. connectivity. This guide will walk you through how to create those implementations. The TM uses a singleton pattern and the instance of the TM is created and initialized while being retrieved. The pointer to the TM is provided to the developer. If TM is initialized once it must not be initialized again. If the customized TM is created from scratch, it is up to developer to choose the initialization mechanism. For processing the events coming from devices. Also TM creates and initializes all available Transport Adapters (the default and/or customized ones). If appropriately configured TM may load the information about previous state and perform necessary actions (e.g. 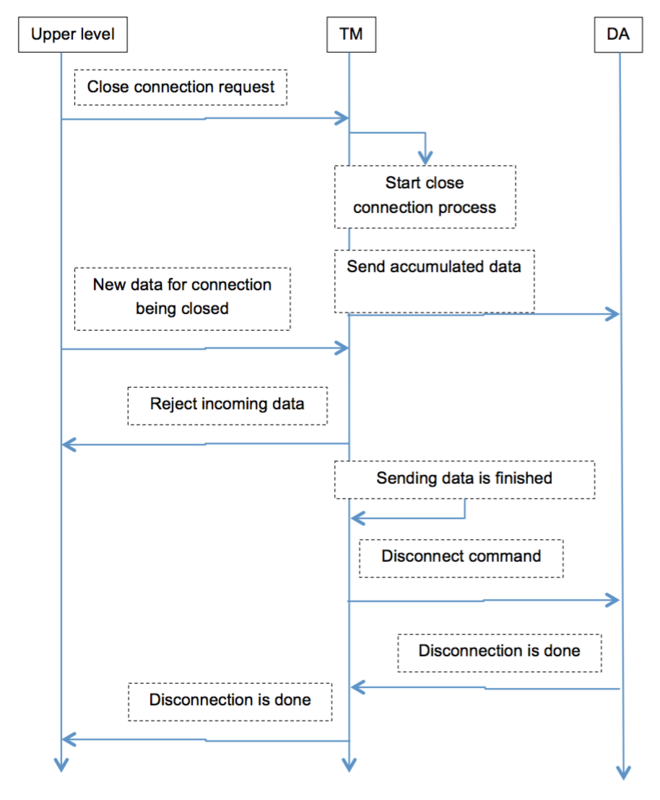 reconnect the last connected application). When its internal threads are created and are ready for working (i.e. the ‘init()’ function is serial and if it returns the control, the initialization has completed successfully and TM is ready for working). If any of TAs failed to initialize, this is informed into the log file. TM answers with erroneous messages to the requests related to such TA. If there are NO TAs (either not initialized or not defined), TM answers with the error messages to all of the requests. TM Core: it is a TransportManagerImpl class. It contains the processing mechanisms (e.g., for procedures of sending/receiving the data, for connecting/disconnecting procedures, etc. ).It does not have the embedded default Adapters and Listeners. And it would not work apart of the Wrapper. TM Wrapper: it is implemented in TransportManagerDefault class. It adds the default Transport Adapter(s) and Listener to the Core completing the fully-featured functionality. The default Adapters are created and initialized by the default TM Wrapper. Then the initialized custom TA and the Listener are added to the initialized TM. 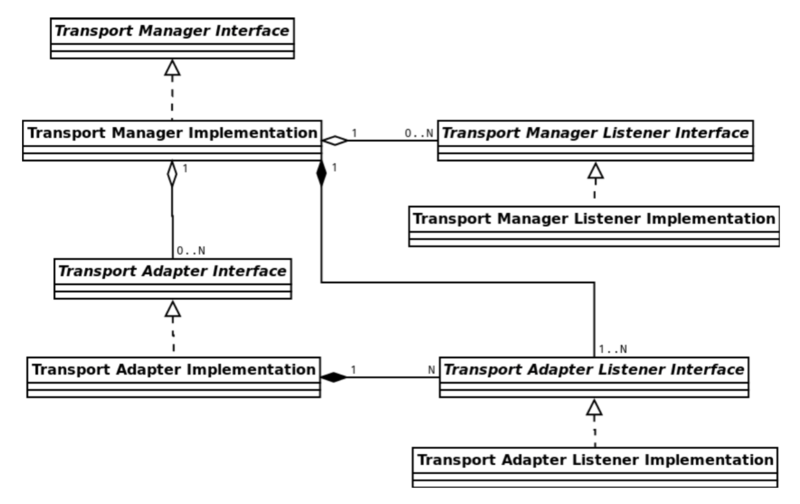 Transport adapter in its turn creates and initializes all available workers. ‘Search Device’ worker creates a separate thread and waits for the ‘Start’ command. 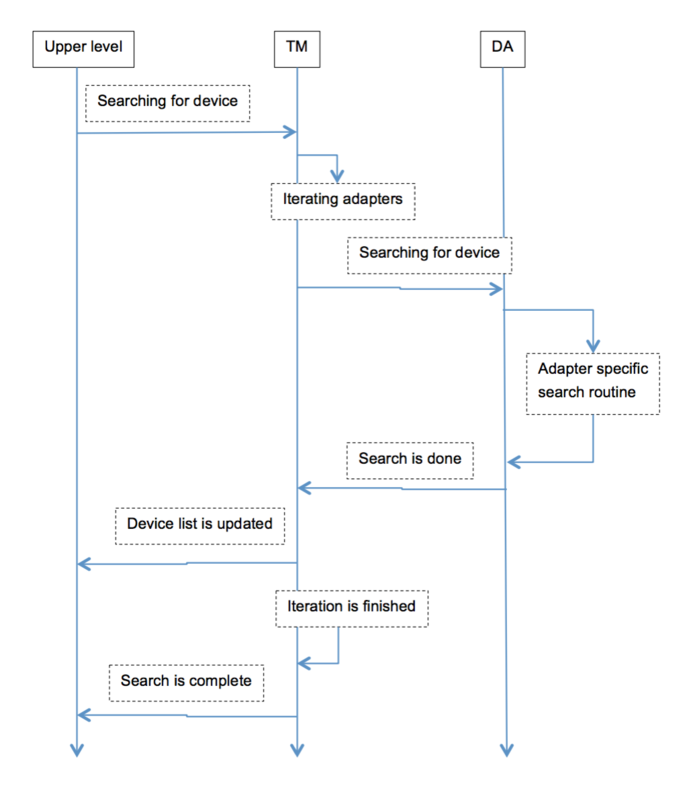 ‘Client Listener’ creates a separate thread and waits for connections from devices. ‘Server Connection’ worker executes all actions on caller’s thread (does not create a thread). Notifies TM on connection created. May start a handshake routine with the application and then notify the user about the application is connected. May close the connection by sending an appropriate command to TM if the application or device is unwanted. When TM is not able to execute any command it will immediately return the appropriate error code. For example: when connect(app_id) is called and TM is not initialized yet this type of error occurs. TM is able to execute a command and there is some error occurred in downstream. The component, where the error has occurred, sends the appropriate information to TM. Then TM provides a notification to the Upper Level. Each message destined for the device is posted into the message queue. The message is removed from the queue after it is successfully sent to the device. TM redirects messages from the Transport Adapter to the Upper Level via notification mechanism. 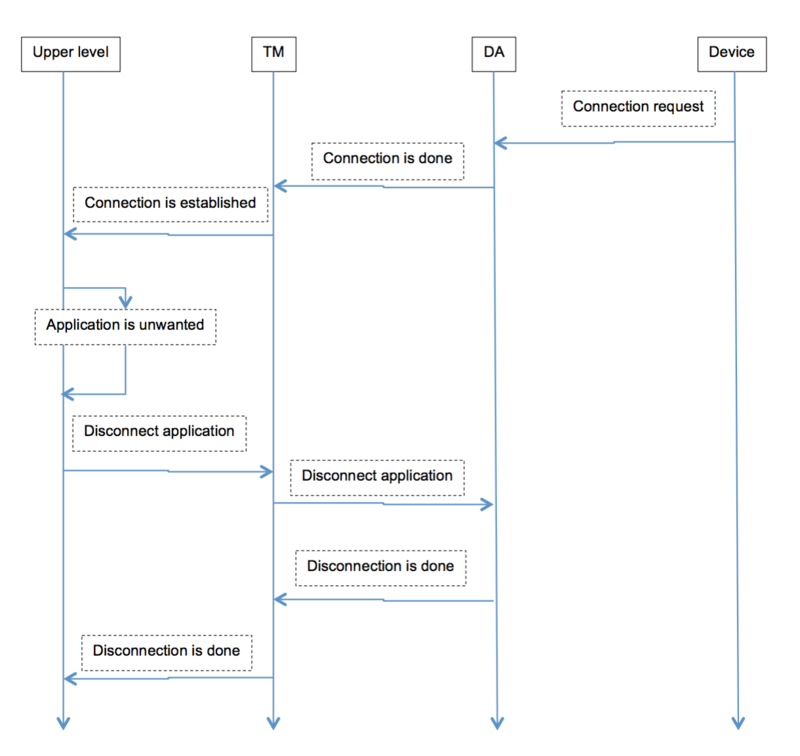 TM uses the pair “Device ID” and “Application ID” for accessing the application on a device and internally for connection establishing. Stands for global unique identifier based on MAC address for network adapters and MAC address like for BT. External device ID – that is an integer value. When the new MAC address is found, the integer value is assigned to it correspondingly (starting from 1 and incremented with every new assignment). When the device is marked as “known”, the correspondence of internal and external IDs is stored (even after power off) until the user explicitly asks to “forget about device”. When the user requests to ‘forget’ the known device, the MAC address may be assigned with the new integer value on being connected for the next time. For one-time connection this correspondence is not saved in long term storage. And if connected later the same MAC address may get the new integer value in correspondence. It is not defined what happens if two devices with the same MAC address would connect. Application ID: is the application unique identifier. It is the incremental integer value assigned and used internally in TM. Connection is represented with a unique pair of “Device ID” and “Application ID”. Connection ID is a system wide unique identifier (incremented integer value) assigned to each new connection. This ID is used for sending/receiving data and for closing the connection. There are no certain rules to define how exactly this ID is assigned. When TM receives ‘close connection’ or ‘disconnect’ commands it tries to finish sending accumulated messages and then closes the connection. If connection is lost TM will drain all accumulated messages and confirm connection closure. When SDL is going to shutdown, TM clears all objects which it has created (e.g. default transport adapters). Objects created by developer (e.g. developer’s transport adapter or listener) are not removed by TM. The developer must take care of destructing his customized objects by himself. Initialization of TM may take some time due to thread creation. After the initilization is complete, the Transport Manager is ready to be used. Any commands sent before the transport manager is ready will be rejected with error code NOT_INITIALIZED in the return value. The TM uses the singelton pattern, thus only one instance of a TM can exist at any one time. This rule can be changed in a custom TM implementation if necessary. The TM has a TCP adapter by default. Adding the new instance of the same Adapter may result in unexpected behavior. The developer must change the standard behavior of the TCP adapter to elinatate any potential problems. If the default implementation of TAs is not suitable, you can create a transport adapter from scratch. The developer can add the Listener to the TA through the customization procedure only. The developer needs to create his own TA on the base of the default one, and then add the Listener to it. If not particularly changed, the default Adapters and Listeners will be used. It may be absent for transport types that do not support searching. Create a class that is derived from TransportAdapterImpl and add the implementation of necessary virtual methods. These workers should use Connection and Device which were created in previous steps. For instance, scanner should add a list of devices to controller. This list will be used later when the connect request is received. To create a data path the connection class should be used. When the connection starts it will update Controller with the pointer to this connection. When everything is created it is time to combine everything. This adapter will use the default connection implementation and default Adapter Listener but three worker classes will implement developer's logic. Also, the Transport Adapter will provide device type in the developer's own way. TransportAdapterImpl virtual (but not pure) methods Store() and Restore() can be reimplemented to provide resumption mechanism. Default implementations for both methods do nothing.